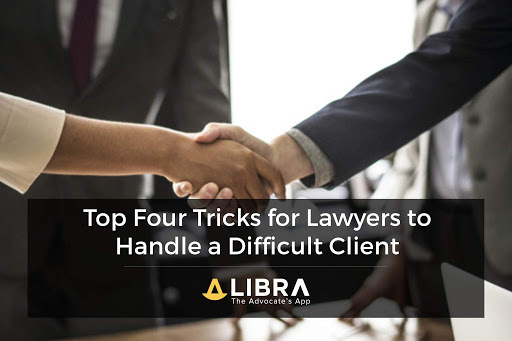 Most practitioners of law at some point of time in their career have had to face a difficult client or a problematic client conversation. Such conversations can arise for multiple reasons and sometimes are unavoidable. Difficult clients are the ones who not only put themselves first but also think only of themselves making them unnecessarily demanding and selfish. This is precisely why knowing how to deal with these clients is of the utmost importance. Every lawyer needs to be aware of how they can contribute to a solution to be effective at communicating with clients. Here are four tricks that will help you deal with a difficult client. One effective way to deal with challenging clients is by not representing them in the first place. Identifying potentially bad clients before a retainer is signed is an important skill that will help you reduce confrontation. Always have a list of lousy client warning signs that will help you identify potentially tricky clients. Here are some methods you could use. Evaluate whether your firm is the right fit for the potential client concerning your values and pricing. Go with your gut and read clients naturally. To be an efficient lawyer who is good with his or her clients, you need to communicate the value of the services you offer effectively. Always try to have an idea about your potential client and have a unique selling point for your services. Being able to differentiate yourself from your competition will help you attract new clients and also maintain a good relationship with them. Also, remember to relate your services to the benefits to the client. Try to think of everything from the clients’ perspective because it helps you sound relatable. It is crucial that you help shape, the client’s expectations at the beginning because clients have expectations about the service provided, the time required and costs involved. If the client’s outlook on ‘service’ is different than what you offer, the chances of them being dissatisfied increases tenfold; therefore, ensure that you manage expectations early on to prevent such mishaps. Always keep the client updated about what’s happening with the case without them having to remind you or pester you. Be proactive and provide regular updates, because they are as anxious about the case as you. Always let the client know beforehand when you are about to make a staffing change. Sending them a bill with revised rates will only lead to fights later on and hence should be avoided. Always present your best work. Make sure that even the drafts are free of spelling and grammatical errors and typos as this makes you look unprofessional. Explain the different options available to them legally and try to make the explanation as simple as can be as they are not trained in law. Give your insight about consequences and potential pitfalls, but always remember to leave the course of action to them. Even happy clients may have additional needs or grievances that you could address to better your service and reputation. Obtain feedback throughout the legal process and document this so that upon conclusion you can analyse your own efforts and take the necessary measures to improve your services. Sometimes arguments arise because clients don’t feel understood. As many legal matters affect clients’ finances, livelihoods, businesses, and relationships, it is often seen that they are very emotionally invested in the cause and hence this can lead to conflict if not adequately addressed. Try to guide the conversation in a way where clients feel understood. Always remember not to get too defensive as this only leads to the escalation of the conflict. Also, remember that it is important to manage client expectation. Everyone has difficult clients. The best way to avoid confrontation is to take the time to educate them and establish rules and expectations. It is knowing how to handle a problematic client that differentiates you from having an unhappy client that degrades your reputation and a happy client that sends you future business. Even a difficult client when handled with tact, common sense and the right measures can turn out to become a satisfied customer in the long run.